The fourth part of the wonderful Vex platformer. 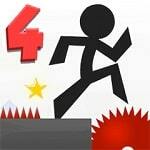 Manage the little man and overcome a huge number of obstacles and traps. Pass the levels and discover new modes and tests. Use all the dexterity and speed to reach the goal!